I recently got the opportunity to check out a nice little BBQ place in Venice. 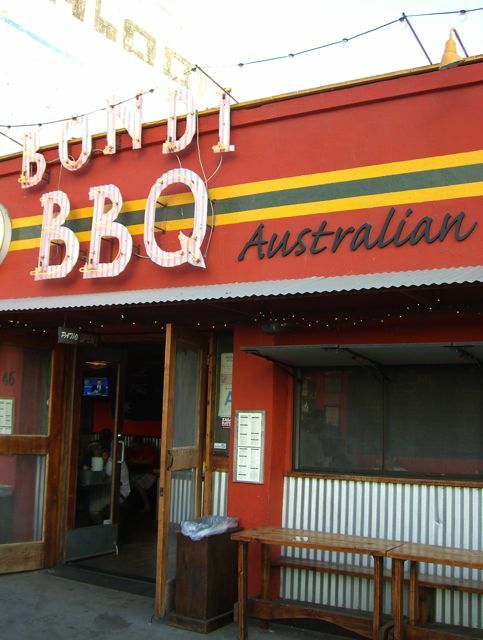 My buddy Jason told me about Bondi BBQ and graciously offered to help me eat their food last weekend. I also got the chance to meet his awesome fiance, Angelica, and I must say that as far as girls go, she’s pretty rad. Because this place came so highly recommended, I had high expectations going into the meal. This was also my first trip to Venice as an adult, so I wasn’t sure what exactly to expect. Turns out that it’s pretty much the same as it was when I was a kid, with plenty of awesome people watching to be had. The restaurant, itself, is not very impressive. It’s pretty much all bench seating and the tables you see out front are where we ended up eating. The weather is usually pretty good down there, so sitting outside is a great option because it can get a little stuffy inside. They also have a back patio, but when we sat down back there, to look at the menus, we quickly noticed that there were way too many flies hovering around to risk eating there. I really hope they get that sorted out, because if it were a little cleaner, it would have been a nice place to enjoy the meal.